This page is devoted to 3ds Max 2 pluggins that I have written. Hair for Max 4.0, Hair for Max 3.0 is a hair particle system. Mesher 1.0 for Max 3.0 this is a simple object that meshes another object such as a particle system or spline. Useful for adding modifier such as UVW Map to a particle system or seeing renderable splines in the viewport. Particle Spline Object Beta 1.01 for Max 4.0, Particle Spline Object Beta 1.01 for Max 3.0, Particle Spline Object Beta 1.01 for Max 2.0 is a spline object that is dependant on a particle system. Basically it takes a particle system and connects all the particles with splines. Used in conjuntion with Surface or Extrude you can get nice wavy flag type animations. Mirror TVs Modifier for Max 5.0 is a modifier that lets you mirror texture vertices, material ids and/or smoothing groups. Animated Camera Map which is the same as the normal camera map except it updates the mapping on every frame. Blob Mod 1.2 for Max 4.0, Blob Mod 1.2 for Max 3.0, Blob Mod 1.0 is a modifier that takes an object and turns all the vertices into metaballs. Deflector+ 1.1 for Max 4.0, Deflector+ 1.1 for Max 3.0, Deflector+ 1.1 for Max 2.0 an improved deflector. 3/15/98 Edit Spline2 Beta for Max 4.0, Edit Spline2 Beta for Max 3.0, Edit Spline 1.55 Beta for Max 2.0 please note the changes in the text file. Interpolate Spline 1.0 for Max 4.0, Interpolate Spline 1.0 for Max 3.0, Interpolate Spline 1.0 for Max 2.0 allows you to set the spline's steps, optimization, and adaptive settings of a spline that has been collapsed or imported. .
Lag 1.1 for Max 4.0, Lag 1.1 for Max 3.0 and Lag 1.1 for Max 2.0 is a new plugin for Max 2.0 which is similiar to LazyPoints for LightWave. Basically it stretches an object as it animates. Object Deformer for Max 4.0 which is a modifier that lets you deform a mesh with another object usually for doing effects like foot steps in the snow. Planar/Spherical/Cylindrical/Spiral Gravity 1.0 Max 4.0, Planar/Spherical/Cylindrical/Spiral Gravity 1.0 Max 3.0, Planar/Spherical/Cylindrical/Spiral Gravity 1.0 Max 2.0 Planar and Spherical gravity are just localized gravity modifiers thus allowing you to limit how far the effect reaches. Cylindrical and Sprial Gravity is also localized modifier that can create whirlpool and eddie like effects. Radial Object Select 1.0 for Max 4.0, Radial Object Select 1.0 for Max 3.0, Radial Object Select1.0 is a selection modifier that uses the distance from another object to determine the selection set. It is useful in conjunction with the grid's render scale allowing you to select localized faces. Remove Dead UVs for Max 4 and Remove Dead UVs for Max 3.0. This is a plugin that removes unused texture vertices from a mesh or patch. It is a temporary fix for the file size explosion problem in UVW Unwrap. Place it at the top of the stack and collapse to remove these unused vertices. Reverse Spline for Max 4.0, Reverse Spline for Max 3.0, Reverse Spline is modifier that reverses the direction of spline. Useful when you are creating cross section for a loft or CrossSect modifier and you have created cross section that are ordered different. Instead having to redraw the spline in a different order just apply Reverse Spline to the offending splines. Vertex to UVW Map 1.0 for Max4.0, Vertex to UVW Map 1.0 for Max3.0, Vertex to UVW Map 1.0 copies the vertex position into the UVW channel so you can lock 3d textures in place when you animate the shape of the object. 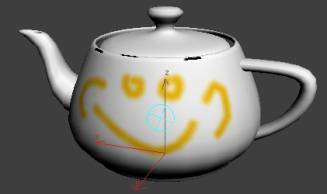 Normally when you use a 3d Texture you can use the XYZ or UVW1/2 to determine the projection. If you use the XYZ option you get a consistent texure but if you animate the shape of the object, the object apears to swim through the texture. If you use UVW1/2 your texture stays locked but you can get distortion or seams since you are using 2d projection. Vertex to UVW Map fixes by copying the vertex XYZ position into the UVW channel. 3D Painter for Max 5.0 which allows you to paint on a bitmap or vertex color channel in the viewport. Float Spring Control for Max 5.0 which is a simple spring controller for float values. FPS Controller is a controller that does simple collision detection while in the interactive mouse mode so you can use drive it like a first person shooter. This is still pretty experimental. Particle Control for Max 4.0 and Particle Control for Max 3.0 is a controller that allows you to bind an object to a particle system. 3/9/98 Patch MatID and Patch Out 1.0 modifiers are a work around to the problem of a patch only being able to hold one material ID. 12/4/97 Calpha, Galpha, and See Buffer for Max 4.0, Calpha, Galpha, and See Buffer for Max 3.0, Calpha, Galpha, and See Buffer for Max 2.0 are various image filters for manipulating the alpha channel and outputing the various other channels such as zbuffer, normals, etc. Mesh to Spline beta 0.4 for Max 4.0, Mesh to Spline beta 0.4 for Max 3.0, Mesh to Spline beta 0.4 is a beta freeware modifier that turns a mesh into a spline so you can use the Surface modifier on it. Now supports regular meshed, regular/capped meshes, and regular non capped lofts. Tested geometry so far includes spheres, cylinders, tubes, cones, tori, grids, and some lofts. 11/6/97 Combustion Stuff for Max 4.0, Combustion Stuff for Max 3.0, Combustion Stuff for Max 2.0 contains Object, Vertex, and Particle Combust for Max 2.0. 4/8/98 Normalize Spline 1.11 for Max 2.0 is a modifier that normalizes a spline. 10/27/97 Path Utility 1.01 for Max 2.0 ia a utilty to manage objects with Path Controllers.